21 | June | 2015 | ReconfigurED. Listening with intent – what your students can tell you about your practices. This article originally appeared in the May 2015 issue of Education Matters Magazine (Primary). During my seemingly short teaching career, there are two questions that I have constantly grappled with: ‘What makes an effective teacher?’, and to a greater extent, ‘How does one measure their effectiveness?’. In my opinion, John Hattie’s (2009) influential work in the study of what makes a difference in our classrooms, has made huge inroads into answering these complexities of teaching. It is with little surprise that Hattie’s work is gaining in worldwide popularity and momentum. His study represents the largest collection and analysis of evidence-based research which investigates what is actually working in schools when it comes to improving learning. I became interested in Hattie’s work after his first major release, Visible learning: A synthesis of 800+ meta-analyses on achievement. After hearing him speak, I took a number of his principles into consideration, mainly in the areas of calculating effect sizes, providing quality feedback to students, and constructing meaningful learning intentions and success criteria with students. 2) Teachers/leaders believe that success and failure in student learning is about what they, as teachers or leaders, did or did not do…We are change agents! Mindframe 4, the idea that student assessment can be treated as feedback to the teacher can be a hard pill to swallow for some teachers. It forces us to realise that every single student in our care has the capacity to learn, and that the teacher and school is responsible for facilitating that progress of each child. Too often, teachers tend to blame ‘undesirable’ outcomes or academic results on student absence, attitude to learning, or social / behavioural factors. However, by believing that we, as teachers, can master ways to progress every child, we can begin to make decisions which will lead to actions that make this happen. 1. I am actively engaged in, and passionate about teaching and learning. 2. I provide students with multiple opportunities for learning based on surface and deep thinking. 3. I know the learning intentions and success criteria of my lessons, and I share these with students. 4. I am open to learning and actively learn myself. 5. I have a warm and caring classroom climate where errors are welcome. 6. I seek regular feedback from my students. 7. My students are actively involved in knowing about their learning (that is, they are assessment capable). 8. I can identify progression in learning across multiple curriculum levels in my students work and activities. 9. I have a range of teaching strategies in my day-to-day teaching repertoire. 10. I use evidence of learning to plan next learning steps with students. More recently, our school was fortunate enough to participate in the Visible Learning Plus program; a guided change process of professional development and practice which is based on Hattie’s work. One of the first topics of conversation, after being inducted into the program, was to complete the suggested checklist by Hattie. For me, the point of seeking ‘regular feedback from my students’ particularly stood out. In the last few years I have come to realise the merit of asking students for feedback on my practise, but I determined that it should be increased in frequency, across multiple subjects or curriculum areas, and at various points of the teaching and learning cycle if I was to be the best teacher I could be. In Bill Gates’ Ted Talk Teachers need real feedback (2013), Gates highlights the concern that despite teachers having one of the most important jobs in the world, many institutions and educational systems lack an effective approach to providing quality feedback to help teachers do their jobs better. He discusses his project Measures of Effective Teaching, which works towards building quality teaching practices, by analysing classroom observations, conducting student surveys, and measuring student achievement gains; which seem to go a long way in allowing teachers to reflect on their practises. I think that the problem of teacher reflection is that, every day, the minds of teachers are filled with processes to carry out and tasks to accomplish. We think about how we meet the needs of a variety of students, all encompassing of learning, social and behavioural factors. We see our role as implementing curriculum that has links to content, outcomes and assessments. We plan and deliver lessons continually, occasionally reflecting in haste. Often when delivering lessons, we are so caught up in the process, that we forget to stop and try to perceive learning from the eyes of our students. We tend not to realise the direct impact on our students, and whilst in ‘teacher mode’, our fundamental role should be to evaluate that impact on our students using a variety of sources. I believe that a powerful source in evaluating the impact of the teacher can be with the assistance of students themselves. The power of honest feedback from the people who matter most in the classroom should never be underestimated. It takes a certain level of bravery, and a possible paradigm shift of ‘it’s my fault they are not learning, not theirs’ in student to teacher relations. However, by listening intently to student voice, one can empower themselves to refined practises by constantly reflecting on their impact to improve. In the past years I have been looking at ways of regularly seeking feedback from students. This has ranged from a variety of paper-based templates and tools to illicit anonymous and honest input from students. More recently, I have prefered to use electronic platforms with increased efficiency and effectiveness for gathering feedback. Using Google Forms (a free online web survey collector) has been a great way to collect feedback from students. A form can be designed with a range of methods for collecting information, from short or long answers, to providing scales or multiple choices. The form is sent to students who can complete the survey on any type of electronic device. Students can easily enter their feedback, and the collection for the teacher is an absolute breeze. At a glance, I can see all of the results and even manipulate the electronic data to filter results and understand trends. Reserving 2 minutes at the end of the class becomes really worthwhile, as you explain to students that their feedback will, in turn, make you a more effective teacher. What could be improved for next time? Were you successful today? If so, how do you know? Will you be able to use this learning later in life? What further questions do you have about ______ ? How much did you enjoy today’s lesson? How much did you learn in today’s lesson? To what extent do you feel that your skills in ______ are developing? How much have you learnt about ______ this week? What do you now understand better after having completing this topic? What would you like to learn more about in the next lesson? Was today’s lesson useful for you? My teacher helps me to achieve. My teacher helps me understand the work. My teacher helps me to learn new things. My teacher sets goals that are challenging for me. My teacher’s lessons are interesting. My teacher makes me feel welcome in the class. My teacher gives clear instructions that are easy to follow. My teacher often gives me feedback about my work. Often, text fields are given to students so that they can explain their reason for agreeing or disagreeing with the statement. There are many factors that contribute to the overall development of students. Influences such as parenting, family situations and social status all contribute to students’ learning. However, in most cases, the manipulation of these factors are completely out of our control. Conversely, the quality of teacher practises that lead to student achievement in the classroom being the largest influence that we do have control of, can certainly be improved through reflection. Personally, I have found that seeking honest feedback from students has helped me to reflect and develop my own professional understanding into how I approach teaching and learning. Sometimes when I read responses from students, I may be affirmed, surprised, or even laugh. On occasions, I have even been mortified! However, I can honestly say that every single piece of feedback that I have received from students has made me a better practitioner. I believe that great teachers are never afraid of inviting or facing difficult challenges. 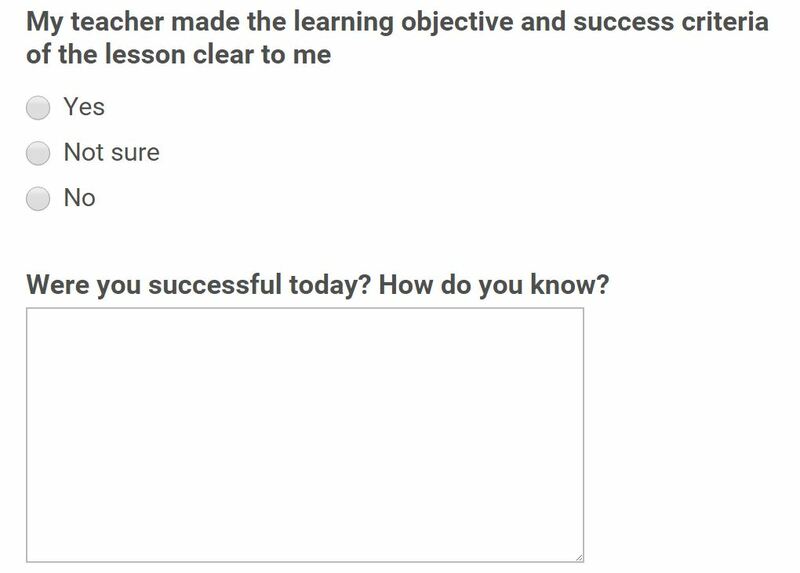 Most importantly, inviting student feedback has helped me to become a better, more empowered, and reflective teacher every year. Hattie, J. (2009). Visible learning: A synthesis of 800+ meta-analyses on achievement. Abingdon: Routledge. Hattie, J. (2012). Visible learning for teachers: Maximizing impact on learning. Abingdon: Routledge.